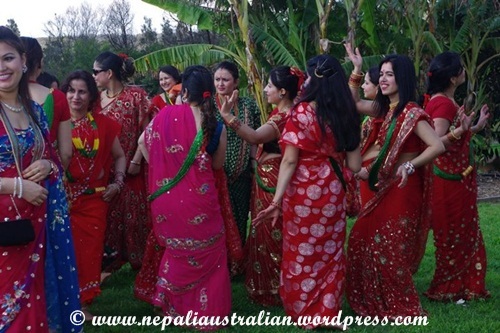 Teej is a four-day-long festival in Nepal and each day has its own significance. First day is called ‘Dar Khane Din’, the day to make merry. The Second day is a ‘fasting day’. The first day of Teej is called the “Dar Khane Din”. On this day, women don their finest attire and gather in one place to enjoy the day. Most women wear red saris or dark pink saris with lots of pote , chura and gold jewelleries. Some even apply henna on their hands. They sing, dance and enjoy a grand feast. The fun often goes on till midnight, after which the 24-hour fast begins. 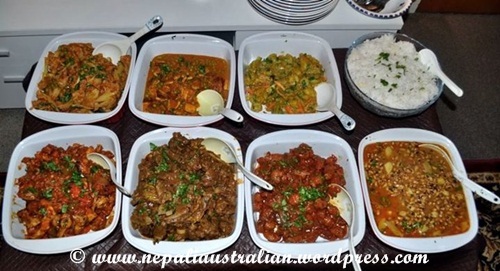 In Sydney, all of us make one dish each and gather in one house. We enjoy music, dance and then have dinner. Even though most of us don’t fast, it is one of the days when we can wear a sari with jewellery and have fun with friends. I really enjoy this day. The photos are from last year’s Dar Khane din. The second day of Teej is the fasting day. Most of the women don’t eat anything and don’t even drink any water for a whole day while others take liquids and fruit and pray for the long life for their husband. This is a very important day as this is the day when women fast and dedicated whole day in pujas and prayers. The holy Pashupatinath temple is the most visited Hindu temple in Nepal during this day and there are be thousands of women in red saris to offer prayers to Lord Shiva. They gather and offer puja to Lord Shiva and Goddess Parvati with flowers, sweets and coins. Lighting of an oil lamp is very important part of the puja ceremony. It is said that the oil lamp should be kept lit all night to forestall evil. They also have a good time singing and dancing around the temple. Here are some videos. 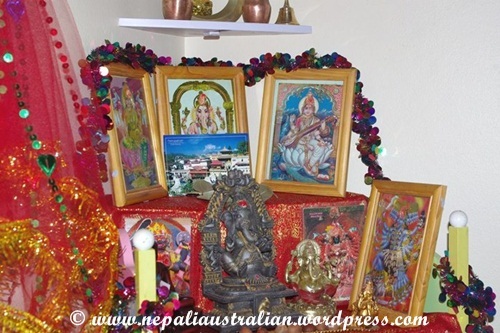 In Sydney, we go to Minto Hindu temple and offer our puja. I was really surprised to see so many women in the temple like in Nepal wearing red saris and performing puja. I don’t fast so after puja I will eat but my friends who fast will continue the fast for the whole day. Women get up at dawn and bathe and perform puja once again to the diyo (oil lamp) and the Goddess Parvati. The most important part of this puja is a banana and holy basil (Tulsi patta) leaf. Only after this puja, women take solid food. This third day of Teej is Ganesh Chaturthi. Women eat Karkalo ko Tarkari with chokho (pure) food made with pure ghee. The fourth day of the Teej Festival is called Rishi Panchami. On this day, the seven sages of the Hindu pantheon are worshiped by women in a belief that it will cleanse all sins of the previous year. Womenfolk take a holy bath with red mud found on the roots of the sacred Datiwan bush, along with its leaves. After three hours of rigorous cleansing, they come out purified and absolved from all sins. This act of purification is the final ritual of Teej, after which women are considered absolved from all sins. 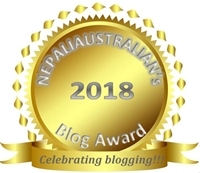 This entry was posted in Nepal, Nepali Culture, Nepali Festivals and tagged 'Rishi Panchami, Chaturthati, Dar Khane Din, fasting day, grand feast, holy basil, life prosperity, Lord shiva, marital bliss, Pashupatinath temple, purification day, Tulsi patta. Bookmark the permalink. Also fast is broken when the sun sets after Puja right? That is so good to know that you so much about it already. This year I get to bake cakes for our celebration and we are doing Dhar khane this Sunday at my friends place. I know some part of India, people do celebrate Teej as well so may be if you know someone there, you can have a joint celebration. A is a very lucky guy to have you in his life. Yes, fast is broken when the sun sets after Puja. Good luck and keep me updated girl. Im not exactly sure if they in particular celebrate Teej. I’ve been muddled with the fact that A is nepali of Indian Origin but Sikkim doesn’t follow as many festivals or culture fests like Nepal. I always found myself doing more “Nepali” things and he would keep telling me, but we don’t do this, people in Nepal do. Always struggled to draw the line between Nepali Nepalese and Indian Nepalese. Im doing Teej this year. My Nepali friends in UK told me it was on the 18th! I was to attend the Tihar there in a red sari but well, Im home now, so no red sari but I’ll do the fast. A is chettri too. And I had no idea Newar’s don’t do Teej. I think you’re the first Newari pair I know 🙂 and its good. This post has told me the pre and post fast functions as well! 😀 Excited to do my first Teej ! Thank you for this – I learn so much from your posts that I wouldn’t even know to look up, so thank you! You and your friends look fabulous, by the way. hehe, I was the kid feminist who kept complaining why the men don’t have to to the same thing for their wives. and then of course, all my aunts, my mom, and grandma told me to shut up. Looks like you’re having tons of fun. Happy teej! That is so true Kay. I always get annoyed that in Hindu culture, women have to wear pote, sindoor and chura to prove that they are married while men get away without wearing anything. Also this festival have so much importance for married woman who pray for long life for their husbands while there is no festival like this for men where they have to pray for long life of their wives. I am glad my family (cast) doesn’t follow this festival so I don’t have to fast. But it is a great day to make merry and have fun. I had no idea that Newars don’t celebrate Teej. My driver here is a Newar (his writes his last name Shrestha Pradhan) and his wife is a tribal Naga (who had to convert before marriage) and they celebrate Teej! Goes to show that maybe when populations immigrate to other areas, they sort of pool their cultural festivals! I know in Kathmandu, Newars don’t celebrate Teej but it might be different in different part of the country.